Spring is a good time to take care of regular maintenance of your boat, before you start your cruising season. With oil, filter elements, and belts readily available, it just goes together, a spring time routine. Performing maintenance in the spring also gives you a chance to reacquaint yourself with the systems on your boat, which hopefully leads to avoiding those bonehead mistakes we all do from time to time. Ever back out of a slip with the shorepower cord still attached? Or catch the rail-mounted BBQ on a piling? Or forget to turn on a valve or switch that keeps some system from operating when you need it? Yes, I've done such things. Finding my groove each spring. Every holiday season the sign at our local fire station reminds us to change the batteries in our home smoke detectors. Kind of the same thing. While you are at it, I have a suggestion. In addition to the above regular maintenance, why not spend an hour or so going over ever terminal and wire connection you can find, and make sure all wiring is tight and secure. Just like hose clamps on all of the ship’s hoses, it is good to go over all wiring connections. John Payne gave great electrical system seminars at TralwerPort, and he learned his trade on commercial ships. He said they do this every six months, making sure all connections are tight. I'm not saying one should sit at the chart station or pilothouse, open up the electrical panel, and tighten those terminal connections. 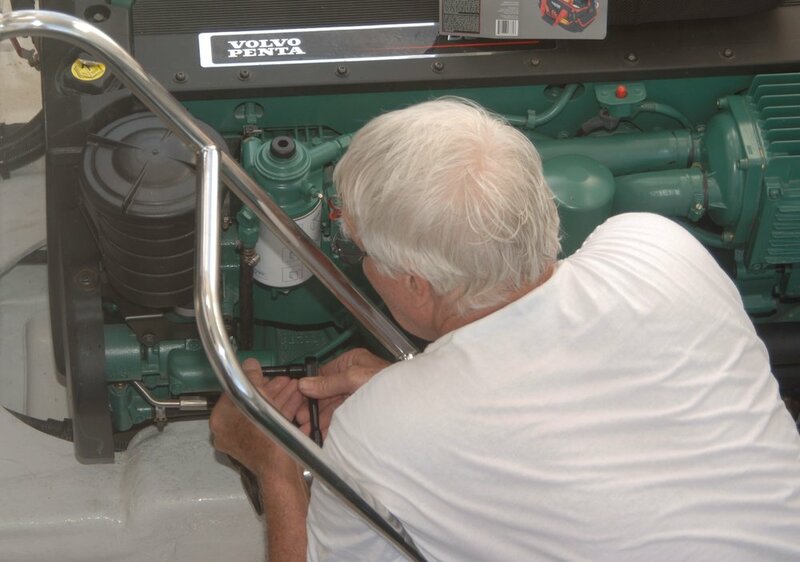 Rather, I'm talking about pump connections, battery terminals, ground wires, alternator wiring, windlass and electric winch connections, and all the motors you have on the boat. It is amazing to discover a faulty windshield wiper is nothing more than someone tugged a wire bundle and the push-on connection came off. Later in Annapolis, as I began to sort out and straighten up the new-to-me boat, I found one of the connections on the Raymarine plotter was loose on a terminal buried under wires from some sloppy amateur work. So how could anyone notice a loose connection in this mess!?! One of the first jobs on the new boat was to clean this up. It should be easy to imagine vibration from running engines, pumps, or compressors. Or accidental bumps from crew moving around an engine space. As long as you can access all of the electrical connections in your boat, making sure everything is tight at the beginning of the season is hands down the best insurance you can provide yourself and your family. And best of all, you just need a screwdriver or two, perhaps a wrench, and there is no dirty oil or rags involved. Just you and a couple of tools. Newer PostMonday Minute - How Good is Your Bilge Pump? Older PostMonday Minute - Look Out The Window!